Tradition and fashion aside, what Terrance Hayes does with 14 lines, over and over, is what seems necessary: the focusing and finessing of a complex voice – by turns melancholy, crass, urbane, incensed – into a mode that keeps his train-of-thought moving while calling at every stop. Rhythm and momentum in poetry are not the same but Hayes seems to have found a successful balance, and the result is a page-turner of a book. The holidays are coming and I dare you to greet a family member with ‘Merry Christmas, I bought you 70 sonnets.’ Even a cultured person would probably prefer to see some Instagrams from your recent vacation – but then they’d have no idea just how entertaining American Sonnets for My Past and Future Assassin can be, or how relevant. This aggressive scourge of the classifieds may be a pastiche but he’s not as funny as the self-deprecating counterpart who confesses that ‘On some level, I’m always full of Girl Scout cookies’. (To be fair, there is behind these masks a sensitive moral compass rejecting the idea that ‘what you learn making love to yourself matters / More than what you learn when loving someone else.’) Later, a claim such as ‘men like me / Who have never made love to a man will always be / Somewhere in the folds of our longing ashamed of it’ says something about the reformation masculinity is undergoing, for good or ill. Elsewhere, the Philosopher Hayes can come across as glib: to say that ‘When the wound / Is deep, the healing is heroic’ may be true but it also smacks of the inspirational meme. Nevertheless, the sheer variety of voices on offer here is impressive. The other, more pressing sense in which these are American Sonnets for My Past and Future Assassin is that they are, well, poems about dying in the US. True to the polyphony of Hayes’ personae, however, the book’s subject is complex, more than a kind of figure stalking the zeitgeist, e.g. the homicidal cop. Rather, the assassin – variously embodied as the poet’s own heart, the grim reaper and, yes, the white shooter – is a kind of anti-muse whose inspiration is terror. Why you should die for me if I will not die for you? I do. Elsewhere, sheer frustration bursts forth with ‘Goddamn, so this is what it means to have a leader / You despise’. Trump is one variation on the spectre of death, inevitably, though he is never referred to by name. This is understandable: Hayes is right not to tarnish his poetry with such a brand, and besides, there must already be a thousand simplistic protest poems calling ‘the Donald’ out directly. When he moves on from the subject of you-know-who, we’re relieved that this President ends up where he belongs: beneath contempt. The father figure is of course involved in all of this, though Hayes is ambivalent about its role. ‘My father remains a mystery to me’, he confesses, before abruptly adding that ‘Christianity is a religion built around a father / Who does not recognise his son’, as though blurting out a Freudian slip. Elsewhere, he claims that for a son to look at his father is to ‘see who he was / Long before he had a name, the trace of / His future on earth long before he arrived.’ Is this theory or observation? We can’t be sure. The idea that to be in relationship to one’s father is ‘To be dead & alive at the same time’, however, does temporarily put the Assassin in check. But does the Assassin win in the end? The idea that ‘To be free is to live because only the dead are slaves’ (one of the most loaded lines in the book, perhaps) makes it clear the stakes couldn’t be higher. But when living feels like slavery, what’s the difference? ‘Can we really be friends if we don’t believe / In the same things, Assassin?’ he asks, virtually summing up the impasse at which liberals and conservatives find themselves. But it’s not the poet’s job to answer such a question, especially when he has ‘almost grown tired of talking’. Another review could paint a very different picture of American Sonnets; that’s how rich it is. Hayes’ sister dying, Coltrane and Davis jamming, Emily Dickinson masturbating – hopefully these mad, sad scenes and more would get their due. Could the collection be improved? Absolutely: I worry that the (admittedly pleasing) conceit of having each section comprise 14 sonnets (a ‘meta-sonnet’, so to speak) meant that weak pieces were allowed to stay just to make up the numbers. But it’s an essential text at this time, and one whose idiosyncrasies more or less fulfil Hayes’ own maxim: ‘The song must be cultural, confessional, clear / But not obvious’. 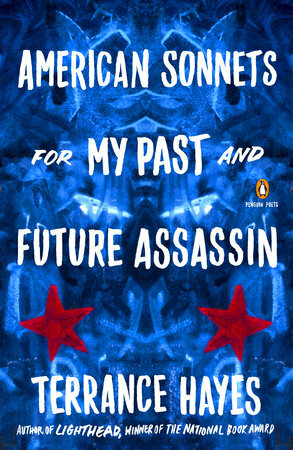 You can find out more about American Sonnets for My Past and Future Assassin by Terrance Hayes from the Penguin website.